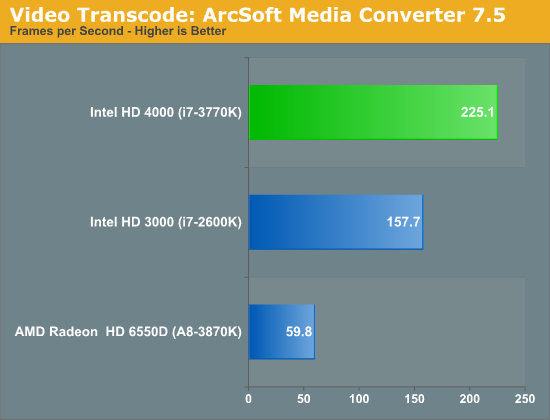 Late last year we mentioned that Intel would be bringing improved QuickSync to Ivy Bridge. Details were scarce, but we theorized that improvements to Ivy Bridge's video decoder might be part of the reason. At least with the drivers we tested with, improved video decoder speed was largely responsible for the advantage you can see below. Once again we're showing a ~40% improvement over Sandy Bridge - a big step forward. The QuickSync side of IVB is one of the lesser known aspects of the architecture, I suspect we'll have to wait for the launch to truly understand what we can expect from Ivy. Needless to say, QuickSync is even faster this year.